What is Loan Agreement Template? Personal loans agreement is good for both lenders and borrowers as it clarifies loan terms and sets aside all misunderstandings that can appear. 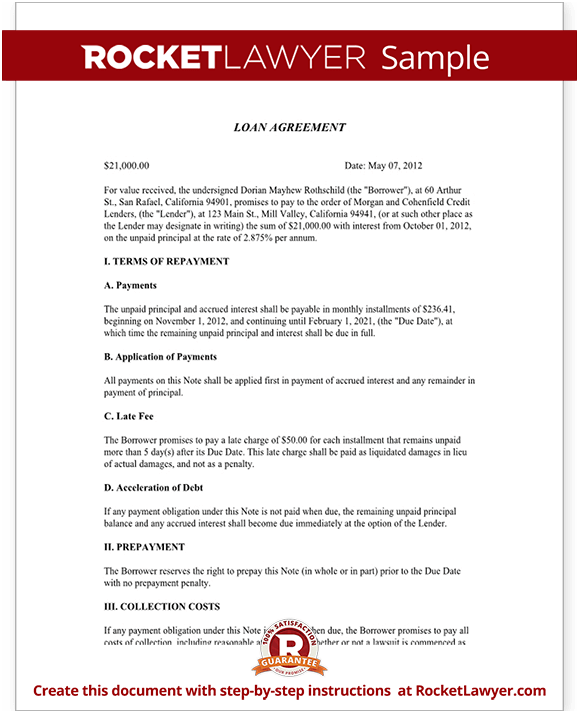 This agreement contains all negotiated statements and covers how much one has borrowed and under what conditions. The aim of the agreement is to avoid misunderstanding in arrangements. So, if you want to protect yourself (clarify the interest, additional fees, regular payments, loan term, state the collection measures, etc. ), it’s better to sign the special document. For this purpose, you will need to fill in the free loan agreement template. You state the amount of the loan. Then you define the repayment plan: the size and the frequency of the payments. After that, you should mention collateral and the co-signer if needed. Information about the late fees and collection costs follow the previous items. Then the author of the family loan agreement template clarifies the loan sales if the lender doesn’t manage to fulfill the arrangement. You can download free loan agreement template on different resources in Word format.